When you think about a stockpile, the first thing that comes to mind is food, right? 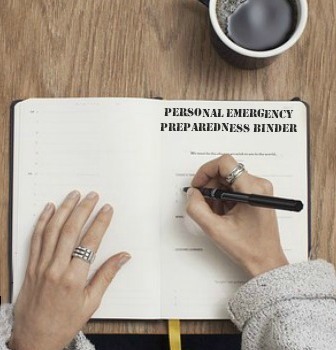 Preppers are well-known for having a stash of long-term food to sustain them through anything from a winter storm that leaves them stranded for a week to the end of the world, but there’s a lot more to a good stockpile than edible items. Think about the things you use on a regular basis that you purchase from the store. Personal hygiene items, school supplies, cleaning supplies – the list goes on and on of consumable goods that you use without really thinking about it. Ever since my kids were little, I’ve always kept a stockpile of these types of goods. And there have been occasions in my life that I was very grateful to have them on hand. When I was unemployed for a few months, I didn’t have to run to the store to get day-to-day items, nor did I have to do without. I was able to simply go shopping in the pantry and meet my family’s needs. Because of this, we survived a stressful situation without the added stress of not having the things we needed to live comfortably. Shopping for non-food stockpile items is much like shopping for your grocery stockpile. It’s essential that you get the best deal you can. If the deal is really epic, sometimes I stock up on brands that we don’t really use so that I have some items on hand for a friend who may have fallen on hard times. A gift of health-and-beauty supplies would be very welcome to someone who has lost a job or otherwise fallen on hard times. Watch the flyers. Sometimes these types of items are loss-leaders, which means the store will be selling them at a loss in the hope that you’ll buy some of their more overpriced merchandise. Buy in bulk. Sometimes you can get a good deal by purchasing items in quantity. Places like Costco, Amazon, and Winco often sell non-food supplies in packs of 3, 6, or 24. Be sure to do the math and confirm that you’re really saving money, though. Sometimes they can be tricky. Hit the dollar store or clearance store. I get lots of great stuff at our local Grocery Outlet, part of a chain. They sell lots more than groceries and often have organic brands of health and beauty aids for a fraction of the price that the boutique stores charge. The dollar store can also be a good source for certain items. Take care not to get something of terrible quality that won’t really work, though. Clip coupons. If you’re a coupon-er, good deals can often be found on high quality, name brand items. 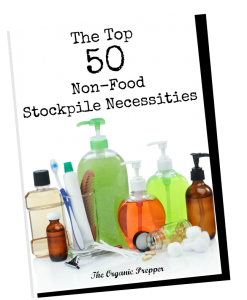 Your expanded stockpile will save you time, money, and stress. When you have a well-provisioned home, you can meet most situations with aplomb. Scenarios that would have other people scrambling to provide the basic necessities for their family will hardly register as a blip on your radar. You can click the links to find reasonably priced options for some items. What non-food items do you store? Do you also have a stockpile of non-food items? What do you keep on hand? Share in the comments section below.